Giacomo Puccini’s wonderful Chinese-inspired score, which includes the super-hit aria Nessun dorma, is one of the main reasons his final opera Turandot – which tells the story of a princess who brutally executes the string of suitors who fail her riddle test – has remained so popular. It continues to receive performances around the world, despite the opera being incomplete at Puccini’s death in 1924, leaving composer and pianist Franco Alfano to craft an unsatisfying ending that doesn’t really ring true to the violent struggle preceding it. Not to mention an Orientalism that was already sitting uncomfortably in the last decades of the 20th century. Rather than aiming for anything close to an ‘authentic’ ancient China, Graeme Murphy’s 1990 production leans into the fairy tale Exoticism of what Clive Paget once described as “an Italian composer’s view of a German poet’s take on an Italian comedy based on a Persian-eye view of Chinese history,” rendered here on stage by an Australian director/choreographer (and revived by Kim Walker) in billowing fabric, kaleidoscoping fans and cascading ribbons of blood. Murphy’s production, with lavish set and costumes by Kristian Frederikson, is a known quantity and as it nears its 30th birthday it is showing its age somewhat – but it’s doing so gracefully and there is still much to love in the seething chorus scenes and flowing dynamism of the production. 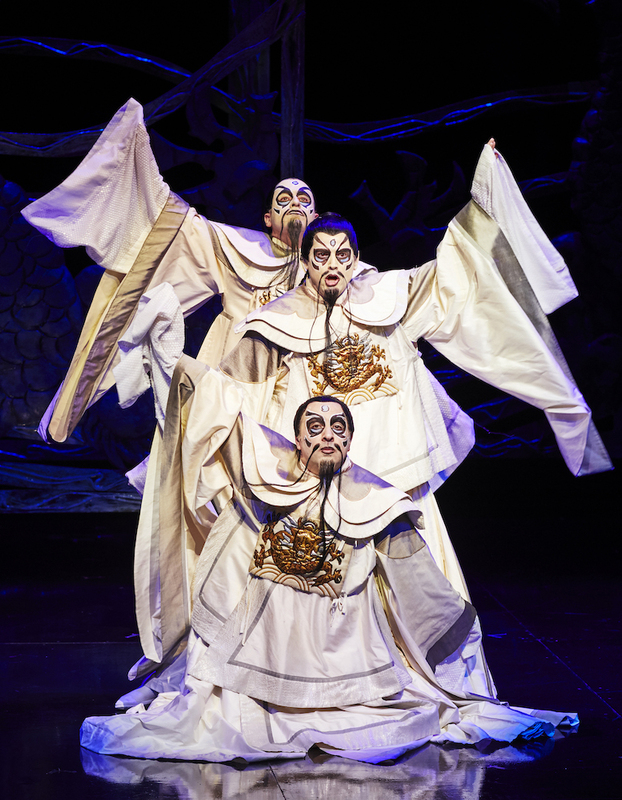 And it is certainly a well-loved mainstay of the Opera Australia repertoire, last wheeled out in 2015 with Lise Lindstrom as Turandot and Yonghoon Lee as Calàf (Lindstrom returns to the role later in the year in Melbourne, while Lee will take over as Calaf in Sydney next month). 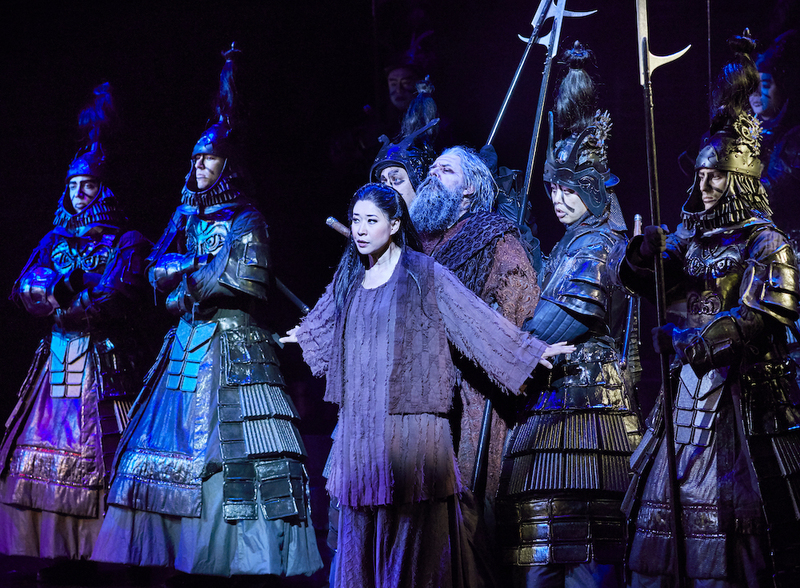 Our Turandot in this outing is soprano Amber Wagner, who made her role debut as Aida for Opera Australia last year in a formidable vocal performance, wielding the kind of vocal power that makes for a fearsome, bloodthirsty princess. She wielded that tremendous power deftly, giving us a Turandot to be reckoned with. If, on opening night, her In questa Reggia didn’t quite have the softer moments to really drive the drama home at the aria’s peak, it made up for it with a lustrous tone and soaring lyricism. In the final scenes, however, she blazes like the dawn, delivering a satisfying vocal climax to the opera’s three-act arc. Dramatically she gives a nuanced performance and her portrayal of Puccini’s icy princess is commanding but remarkably human – sympathetic, even – Wagner doing an admirable job of charting a believable journey from hatred of Calàf, who is sung by Spanish tenor Andeka Gorrotxategi, to love (or at least acceptance of her fate) – no mean feat to pull off. Gorrotxategi, who was seen most recently in Sydney as Don José in 2017’s Carmen on Sydney Harbour, brings a secure, polished tenor to Calàf, with an alluring bronze hue to his sound. His vocal athleticism is a fine medium for the prince’s youthful, blinkered self-confidence, and while some of his ‘thinking’ poses in the riddle scene are a tad unimaginative, his cocky insouciance more than makes up for it – you can see why Turandot might be riled. Vocally, Gorrotxategi’s cries of “Turandot” in the first act ring out powerfully, but while his Nessun dorma is nicely shaped, there were moments when it felt like he was pushing, and a swift cut off to the final note – after a nicely resounding high B ornament – robbed the well-known aria of some of its impact. Korean soprano and Opera Australia regular Mariana Hong’s Liù was a highlight, her sound perhaps a shade delicate in the opening but unfurling in the final act, Hong’s performance earnest and expressive, and her Tu che di gel sei cinta stunning. She returns later in the year to sing Cio-cio San in Madama Butterfly (as does Gorrotxategi, as Pinkerton). Bass Richard Anderson was a convincing Timur, Calàf’s ageing, blind and exiled father, while Graeme Macfarlane puts in a fine turn as his opposite number, the emperor Altoum, singing from high atop his pyramid of robes. Baritone Christopher Hillier and tenors Virgilio Marino and John Longmuir almost stole the show as the Commedia dell’arte-inspired trio Ping, Pang and Pong, nicely matched vocally and getting laughs from the audience as they navigate Murphy’s fun choreography. The musical Chinoiserie of Puccini’s score, with its glittering percussion and ear-worm melodies, was beautifully rendered by the Opera Australia Orchestra under Christian Badea. The Opera Australia Chorus is one of the company’s great strengths and they were in fine form here in an opera where they drive the action of the first act particularly, swaying and shifting in Murphy’s fluid crowd scenes, the children’s chorus snaking around the stage as they sung their folk song with exquisite, simple clarity. This is an opera that should make the hairs stand up on the back of your neck and ultimately – despite many fine moments – the elements of this performance didn’t quite gel for me in the way the 2015 outing did. That said, Puccini’s music means this opera is always going to be a good time, and if you haven’t seen Graeme Murphy’s production before, it’s well worth a look. 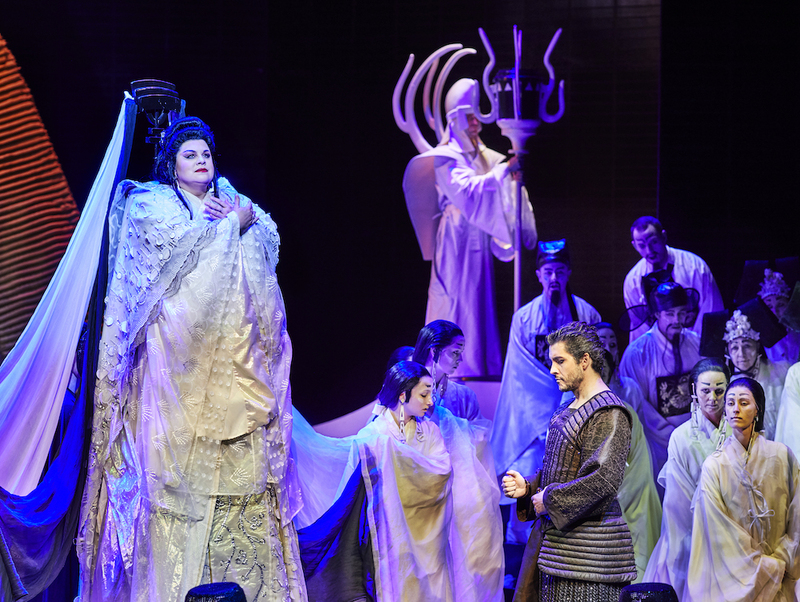 Turandot is at the Sydney Opera House until March 30. It plays at Arts Centre Melbourne November 19 to December 6. As two of the 100 judges on Channel 7’s singing show, Jacqui Dark and John Longmuir explain why they took part, and why they’d never be contestants.